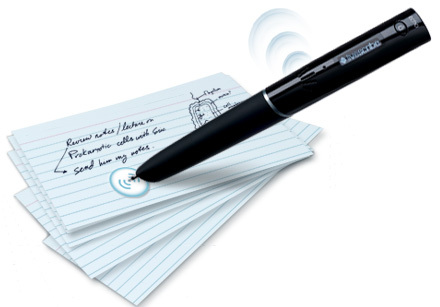 As previously posted, the Echo or Pulse Pen is wonderful note taking tool for students to take notes and simultaneously record lectures (audio record) using special Livescribe notebook paper and the electronic Echo or Pulse Pen (Echo is their newest pen and Pulse the first generation of the Livescribe Pens) . The beauty of this pen is that you can write or draw as much or as little as you want to when note taking. The recording tool records what is spoken at the same time as you write and is able to be played back (out loud) from the pen using menu tools provided on the paper and tapping in your writing on your Livescribe paper. I have recommended this pen for students in K-12 education, college students and business people who have difficulty with spelling, reading, recall or comprehending when gathering information from lectures, meetings or interviews as a few examples. It’s appearance does not suggest a special need, just looks like another electronic gadget -which it is! Valuable tool? Yes! – and for more than just note taking! We have been using the Pulse Pen at our school for about the last two years not only for note taking but also as a medium tech tool for adapting worksheets for students who have difficulty accessing print. As a highly mobile alternative to scanning worksheets into a computer, one of our awesome paraprofessionals at our middle school (You are awesome Mary Jo!) has been recording information on sticky labels printed with Livescribe paper (this can be done on sticky/adhesive labels with laser printers from the Livescribe Desktop) for students to listen to recorded information of the print on the worksheets. Using the sticky or adhesive labels with printed Livescribe paper, the labels are placed on assignment worksheets, recorded on with worksheet information or directions for the assignment. Labels can be cut to smaller sizes to fit on the worksheets so they do not cover print or images (you don’t need much space, just enough to record or mark and answer). This provides an auditory means of accessing the worksheet text using the labels and pen and also a way for students to record their answers using the labels provided. The pen looks very typical and worksheet only have small pieces of labels stuck to them. Worksheets, study guides and vocabulary lists are a few of the uses for this modification using the Pulse Pen or Echo Pen. Just the other day I walked into that tech savvy multi-categorical classroom. Students had a resource period and were seated at the table independently reading and reviewing vocabulary and worksheet tasks using the Pulse Pens. Without such adaptations a paraprofessional would need to be reading the information to the students. Hats off to the students and kudos to the paraprofessional who had prepared the accommodation! Did it take additional time for her to do that? Of course it did, but did she gain the student’s sense of independence and self-determination in the process? Yes, and she probably gained time to help another student with their LLI instruction, adapt the next lesson or manage the gazillion of other needs in that multi-categorical classroom! What I did not realize is that Livescribe has produced an app for the same thing that also does more! Time to tell Mary Jo and request the …. Livescribe Echo/Pulse pens have a number of additional apps for purchase providing different tools that can be loaded onto your pen. One of the new tools is called the Sound Sticker which records messages on small stickers that can be re-recorded on using the app software on your pen. A similar concept as what we had done with creating labels, the Sound Sticker audio can be erased and re-recorded, possible on the pen, but not as simple of a process as having a delete button on the menu when removing a record audio using the Sound Sticker app. Available on the Livescribe website at $24.99, convenience of the app as well as stickers provided may be well worth it when time is a commodity that is hard to come by. For more information on Sound Sticker App, or the Livescribe Echo or Pulse Pen in K-12 education visit their website for videos describing many ways it can be used. There are videos of creative ways it has been used to support education, and of course only limited by your imagination and needs. For information on the Livescribe pens with different memory capacity, more apps (dictionary, spelling apps and more) and accessories (different size and types of notebooks, cases, etc. ), visit the Livescribe store. You will also find refurbished pens available at a discounted price! Explore the Echo/Pulse Pen and be creative in ways it can help support your students! If you have questions on how to print on sticky labels feel free to leave a question in the comments. Hats off to Mary Jo and Linda for their never-ending search for tools and additional time taken to support their students! You are awesome! This entry was posted in App Reviews, Apps for OT's, Apps for Special Needs, Digital Recording, Note Taking, Occupational Therapy, Special education and tagged digital recording, Echo Pen, Note taking, Note taking accommodation, occupational therapy, Pulse Pen, special education, special needs students. Bookmark the permalink.